Metro Fare Hikes: Who's Hit the Hardest? Metrobus riders are more likely to be poor, minority, unemployed and transit-dependent than Metrorail riders. So shouldn't WMATA pay special attention to their needs when planning service and fare changes? Photo: greychr. 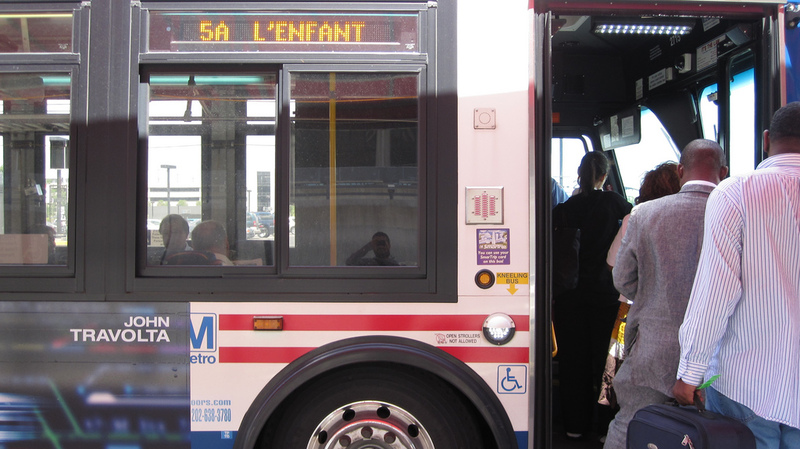 Metrobus riders are poorer and have fewer transportation alternatives than Metrorail riders, says Washington Metropolitan Area Transit Authority (WMATA) data – and they face the biggest fare hikes under current proposals. Rail passengers, who face a 15% increase in fares (from $1.65 to $1.90 during peak period), have a median income of $102,000, are 75% white, 18% unemployed, and only one in 50 lives in a household without a car. Bus riders, on the other hand, face a 20% increase in fares (from $1.25 to $1.50 during peak period). They have a median income of $69,000, are 50% minority, 23% unemployed, and one in five has no car in the household.It’s no surprise that D.C.-area bus riders are more transit-reliant and less able to pay than passengers of higher-cost forms of mass transportation like Metrorail. These people are often dependent on the bus to get to work, school, medical appointments and shopping. Some can’t afford to use Metrorail, and others aren’t well served by it. For these riders, fare hikes and service cuts could be catastrophic. Is WMATA making any special allowances for these populations? Should it? So, the emphasis seems to be on the greater good – impacting the smallest number of riders – without considering any one group. Some may argue that this is the most practical way of approaching service changes. Others see transit as an essential service that connects people to opportunities and allows them to meet their basic needs. To them, it is wrong to ignore the impacts on populations that would be marooned by service changes. WMATA might learn from New York City Transit, which seems to take a more proactive approach to the social justice aspect of transportation decisionmaking. The agency considers the impacts on minorities and low-income populations when analyzing operations every three years and whenever a major fare or service change is proposed. For instance, when considering a bus route change, NYCT evaluates routes based on performance criteria similar to those used by WMATA. The bottom third for performance are selected for further examination. The agency then examines travel time and cost in all Census tracts (designated minority or non-minority based on the population) within a quarter mile of the routes. Statistical tests compare trip time and cost changes across demographics for each route. A proposed route change has no significant disproportionate impact if trip time and cost changes are the same between demographic groups in the service area. If disparities are found, suggesting more negative impacts to protected groups, corrective action would be taken. These social justice analyses now form an integral part of NYCT service planning. For example, the approach was used to design a package of service reductions in 2009 in response to the economic downturn. The agency wanted to have the least impact on the smallest number of patrons, but also to avoid disproportionately impacting vulnerable groups. As a result, NYCT was able to design a proposal that met budget criteria with few effects on heavily minority or low-income routes. As Metro officials attempt to cover the looming $189 million operating shortfall, they should certainly endeavor to limit service and fare change impacts to the smallest possible population. But they must also pay special attention to the riders with limited incomes and no alternatives to transit. Some of these people are already feeling the pain of last month’s 10-cent increase in bus and rail fares. If future changes hit vulnerable groups even harder, we could see severe economic and social consequences. These equity considerations may also be one more reason for policy makers to consider revenue-raising options (like congestion pricing), where funds could be used to offset the rising transportation costs faced by low-income groups.